At 65 miles per hour any vehicle, commercial or passenger, is traveling 95 feet per second. However, the distance required to stop a vehicle changes dramatically as the size and weight of the vehicle increases. Simply stated, larger and heavier vehicles require more distance to stop than smaller and lighter vehicles. A passenger car traveling 65 miles per hour can brake to a controlled stop in approximately 316 feet given a normal perception and reaction time by the driver, or about the length of football field. A tractor trailer traveling 65 miles per hour with the same perception and reaction time by the driver would require 525 feet to brake to a stop, or almost the length of TWO football fields. Stopping distance is just one example of how tractor trailers present different hazards than passenger cars. The unique safety challenges presented by tractor trailers are the reason the Federal Motor Carrier Safety Administration enforces specialized rules called the Federal Motor Carrier Safety Regulations (FMCSR) against large commercial vehicles. The FMCSR apply to employers, employees and commercial motor vehicles engaged in interstate commerce. The FMCSR require drivers to submit to specialized tests in order to drive commercial trucks. Drivers are required to engage in pre-trip safety inspections and maintain log books that document their driving time, rest time and off-duty time. The FMCSR limit the number of hours a driver may operate a commercial vehicle. The FMCSR require the trucking companies to maintain records related to their driver’s qualifications and maintenance of their trucks. All commercial vehicles are required to meet certain braking standards as well as many other safety features to prevent collisions. Because of their weight, collisions involving commercial vehicles often result in catastrophic injuries or death. Our firm has handled numerous cases where tractors trailers were travelling either above the posted speed limit or too fast for conditions and unable to stop in order to avoid a collision. We have represented the family of persons killed by drivers who were fatigued and operating their vehicles beyond the limits allowed. 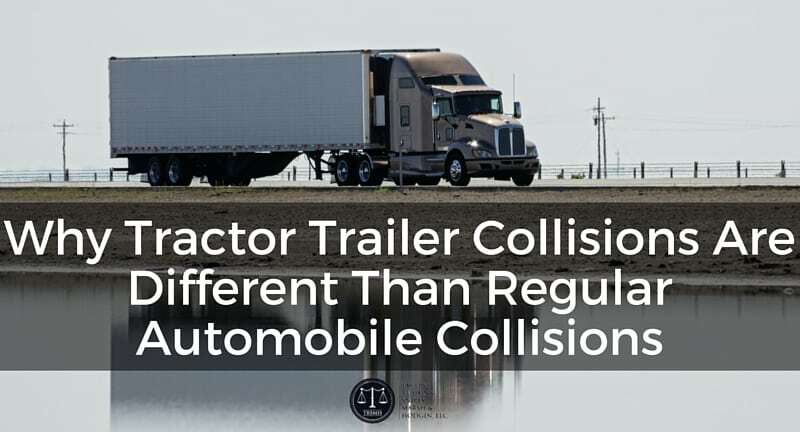 Tractor trailer collisions are very different than automobile collision and need the experience of an attorney familiar with these differences. If you or someone you know has been injured as a result of a a tractor trailer or other commercial vehicle, contact our office for a free consultation. Appreciable article. I recently got a requirement for trailer servicing when I needed to transfer all my stuff to new home. The only option I remained with was to hire trailers on rent from Saxon trailers in Surrey.